For many lizards, global climate change is a matter of life and death. After decades of surveying Sceloporus lizard populations in Mexico, an international research team has found that rising temperatures have driven 12 percent of the country's lizard populations to extinction. An extinction model based on this discovery also forecasts a grim future for these ecologically important critters, predicting that a full 20 percent of all lizard species could be extinct by the year 2080. The first step of reading a Press Release is to check the photos. Unfortunately in this case the photo doesn't look photoshopped so we can't deny the science out of hand on this occassion. Next read the press release carefully. Everything we need to deny can be found in the press release - don't waste time tracking down the "journal reference", that's just some notes or something. Examine every sentence of the press release very carefully for problems. Okay the first thing we can exploit is how much this all cost. They say they spent decades surveying a lizard in Mexico. That must have cost a lot. Who paid for it? No doubt it was the taxpayer. Is there even a stationary audit? FOIA anyone? Immediately I am very much opposed to this press release. Then there is evidence that this "international research team" is far from objective. For example they seem to know way too much about lizards for their own good. It's a vested interest. I would have been far more convinced if it was a team of international car mechanics who reached the same conclusion without knowing a thing about lizards. Also note this is a Research Team, so yep that means team science. Social networks anyone? Then they ran the program in a LOOP until all the lizards were dead. Then they blame it on global warming. I should be shocked at such shenanigans, but this kind of postnormal science is sadly all too common these days in climate "science". The press release also uses the phrase "a grim future", blatant Alarmism. Who decides whether a world with less reptiles is more grim? What's the optimum level of grimness? Perhaps less lizards would be better? In fact YES it would be better with less lizards. Notice that the Team try to convince us the lizards are friendly by calling them "critters" rather than the cold blooded bastards we all know they are. The Team use a trick to hide a little known fact about the origins of the word Dinosaur (the trick is called omission). In Greek dinosaur means Terrible Lizard. So naturally we come to Jurrassic Park. 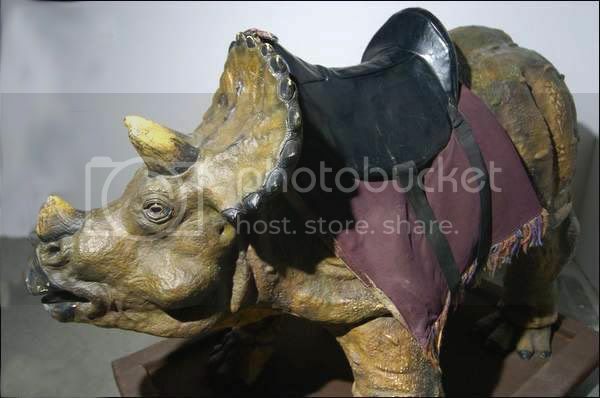 One of the key lessons Jurassic Park taught us was that dinosaurs are notorious killers. They gang up, chase after cars and have even learned to open doors. Certainly we do not want them returning. A future with less dinosaurs will be far from grim. How many dinosaurs exist today? If you exclude alligators and Reptilians then there are probably none. But remember a key lesson from Jurassic Park was that Life Will Find A Way. There are things about Intelligent Design that science doesn't yet understand and it's just possible that a pair of Sceloporus lizards in Mexico could breed and produce a proto-tyrannosaurus (or worse - one of the key lessons from Jurrassic Park is that there are as many bigger and better dinosaurs as you can make sequels of a movie. It's best not to tempt fate). You might argue that the little ones don't matter, so lets keep the little ones for our amusement and just kill the big ones. Wrong! That's a logical phallusy called the Slippery Slope. 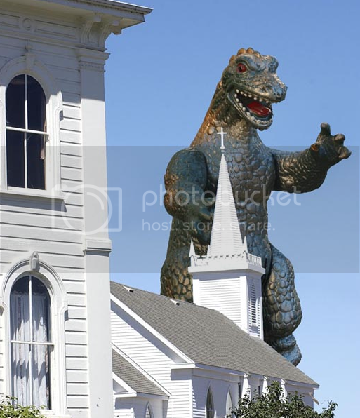 If we tolerate the regular little lizards then we'll end up legitimizing the kinda-medium lizards and before we know it a whole herd of of fully blown T-Rex will appear from left of field. And then it will be too late. It'll be Jurassic Park I, II and III all over again, possibly combined with Mad Max if the oil runs out at the same time. So even if carbon dioxide DID cause warming, that's a good thing as it will prevent the return of the dinosaurs. I checked and SkepticalScience.com doesn't have any response to this argument so I feel I am onto something. My interpretation. My facts. This is the kind of stuff money can't buy unless it's funnelled through a network of think-tanks. Over at The Climate Scum, Baron von Monckhofen has some new Blog Science Research titled Correlation - what correlation? The Baron points out that "This simple graph disproves two of the most egregarious lies of the IPCC cabal: (1) it is getting warmer and (2) the warming is due to CO2. There is clearly no correlation between temperature and CO2! The increase in CO2 is instead caused by the medieval warming period: as we know from the ice cores, CO2 lags 800 years behind temperature. Using the current CO2 levels as a proxy for past temperatures, we can also conclude that it was about 100 degrees warmer 800 years ago"
Read the full post with more information here: Correlation - what correlation?. This idea is very Not The IPCC so I just wanted to help it permeate the Internet. I figure that linking to other people's posts is a good way of amplifying the noise and increasing my own post count with little work on my own part. It's also not my fault if it's wrong. I guess I could even start posting News Articles verbatim, adding just one original sentence with my interpretation of what it all means. My post count should go through the roof if I do that. Which is surely just what the World needs and will reinforce the status of this blog as the #1 Blog Science Blog Of the Millennium. I am a bit of an expert on the subject of planet Venus. I can tell you all about orbits and diameters and other science physics. I recently got to prove this when I was invited to debate the subject of climate change on a local radio station. My tactic was to throw out as many arguments as quickly as possible. At one point I clocked 27apm (arguments per minute). This devastated my opponent who only had time to cross-examine one of my arguments about Venus, so naturally I won the debate. Unfortunately the powers that be got wind of my victory and made sure the interview was never broadcast, but here is the relevant part of the transcript for educational purposes. The other guy's questions are in bold. You've made a whole load of arguments there but I will pick up on one subject I am familiar with - what did you mean when you said "Venus is a con"? It's a big fat con, the planet Venus reflects so much sunlight that it should be freezing. Instead it's really about 800 degrees F. For centuries so-called "climate scientists" have been coming up with all sorts of wacky explanations for Venus being so hot. Typically climate scientists take drugs to come up with their ideas. One of these "ideas" is called the greenhouse effect. They claim Venus is so hot because of greenhouse gases. I discovered climate scientists didn't have a clue. It's all just group think. I found the actual reason for Venus being so hot and it isn't anything to do with greenhouse gases. So you are saying the greenhouse effect doesn't have any effect on Venus? I never claimed that! The greenhouse effect perhaps causes as much as a few degrees F of the 800F on Venus. I believe that's sufficiently low to prevent tax rises and that's all that matters. So how do you explain the bulk of the warming on Venus? Venus has a thick atmosphere and therefore, like my blog schedule, it has a lot of pressure. Pressure leads to stress, stress leads to things getting hot under the collar. On Venus things are about 800F under the collar. In technical physics speak, air gets very hot when it is squashed together. If ever you travel to the arctic be sure to carry a canister of squashed air to provide yourself with a permanent heat source. So you are saying a planet can be warmed indefinitely with a high pressure atmosphere? I didn't make that specific claim, stop putting words in my mouth! The thing you are missing and scientists are missing is that there is a thing called a lapse rate. As you travel upwards it gets colder. So clearly temperature is determined by height, not "greenhouse gases" or "sunlight". That's why hospitals should put patients with hypothermia in the basement. But you said it was pressure now you are saying it is height! Yes I did, I am saying both and at the same time saying neither. If you pick one I will say the other. The only thing I am saying for sure is that it's not the greenhouse effect. That's the main point, the rest of the stuff is just loose justification. Stop going on about it. You are missing the main point which is that it's definitely not the greenhouse effect! Not the IPCC! But where are you proposing the additional heat comes from? Even if all incoming sunlight is absorbed how do you get a temperature warmer than a blackbody without greenhouse gases reducing outgoing radiation? Pressure and height! It's obvious! My Theory of Height predicts that the center of the Earth will be very hot. It is! Your greenhouse gas theory doesn't predict the center of the Earth will be hot. Therefore I am right and you are wrong! This is good old fashioned observational science from yesteryear! Admit your science is a lie! Admit it! was remotely true scientists would have already noted it. No! they suffer from Group Think! Lying fraud group think! Also they arrogantly don't realize they are all wrong and I am right! Just admit it! Can't you just admit it and confess?! 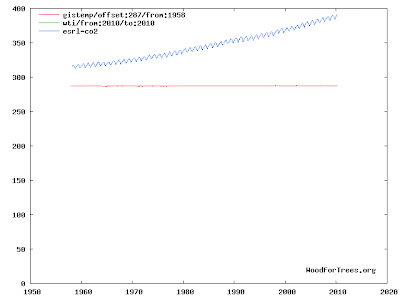 We all know that arctic sea ice decline and global temperature rise peaked years ago and have now stopped, effectively falsifying manmade global warming. A little overlooked variable of climate has also peaked in defiance of so-called "scientists". IPCC climate models predict that solar output should follow an 11 year cycle. According to this "theory", solar activity should now be rising. And at first, probably by fluke, it appeared that was so. But now there's just one problem: The solar cycle hasn't increased for 3 months. 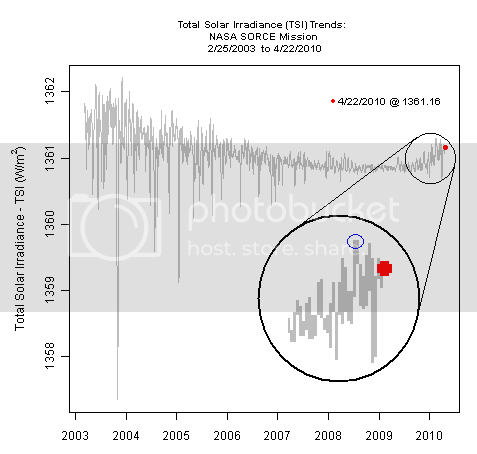 That's right, as the above image shows, solar output peaked in February (marked with a blue circle) and since then has fallen or at best has been flat. It would appear the sun has returned to normal levels. How can the 11 year cycle theory explain this? Solar activity should be increasing, not going flat for three months. Real science abandons a theory when observations disagree. The observations now disagree with the 11 year solar cycle, so all books claiming there is an 11 year solar cycle should be immediately burnt and the models thrown in the dustbin of history. That's how science should work. But thanks to the corruption of science by Al Gore, the "solar cycle" theory of the Sun is guaranteed to be kept alive on a wave of grant funding and IPCC meal tickets. If challenged the alarmists will probably resort to typical excuses about short term variation over long term trends just as they do for global temperature and arctic sea ice. But ask the alarmists this - just what observation would falsify the 11 year solar cycle theory of the sun? How long do we have to go with no increase in solar output until they admit the 11 year solar cycle is a fraud? If nothing can falsify it, it isn't science! See also the following image of orbit adjusted solar flux and sunspot count. All metrics show a peak in solar output occurred in February and there has been a decline since then. This is completely opposite of what I would expect from my idea of the theory. The 11 year cycle theory of the Sun is evidentially falsified. Blog Scientists have been busy making rules that climate scientists should abide by. One of the as yet unchecked auditables of climate science is the stationary scientists use. Why should this matter? Well, for example a pencil with insufficient nib circumference can lead to overtly thick lines being drawn, which may in turn lead to hard to interpret graphs, leading to mistakes and even the very corruption of science itself. As another example, a biro may be half exhausted, merely scratching at the paper rather than leaving it's telltale clear and distinctive mark. Such scratches may be misinterpreted as actual data points. So improper maintenance of stationary is a concern. For this reason I have compiled my own industry strength Principles of Stationary. In the post below I will outline these principles and then apply them to a random field of science to see if that particular field of science passes the test. I was surprised and very concerned to find that the randomly chosen field, climate science, fails abysmally to pass my Principles of Stationary. I won't bother applying the principle to other fields of science as I am sure they will pass. Principle 1a: A pencil should be sharpened immediately before use and observed closely throughout the work process for signs of blunting. Such signs include a measured stress on strokes, subtle scratching sounds and minor fragmentation. On observing any of these signs the worker should immediately stop and resharpen the device before continuing. Principle 1b: If a break must be taken midst work (undesirable), the pencil can not be assumed to have maintained the same sharpness on return. For one thing a colleague may have wielded the device in your absence. Be sure to assess the pencil condition carefully on return. Remember: If in doubt, Resharpen. They say that pens are mightier than swords. This is no joke. Special attention should be made when wielding a pen and careful maintenance is essential. Principle 2a: Before use, pens should be dismantled and cleaned using light fabric and weak solvents. Reassemble the device with caution. Ink cartridges and ink wells must be treated with special care. The potential for ink spills is always high. Principle 3a: Before any ink refill cover all surfaces in the vicinity with water proof coverings. Principle 3b: Never use red ink when compiling maps of temperature. Red ink spillages upon maps may result in inadvertent tax hikes and the collapse of the global economy. Rulers are especially dangerous as they can cause false trends. Principle 4a: All rulers must be carefully analyzed under a microscope before use to ensure they are perfectly linear..
Each record must be signed off by 3 independent scientists. These independent scientists must not be associated in any way with the same field of research or the same institution as the stationary user. They must also be entirely unconnected with the research yet understand it completely. To be properly independent they must not have previously utilized the same item of stationary themselves. The stationary used to update the record sheet must also be recorded in the record sheet. The record sheet must be appended to all published scientific papers as well as a copy being placed online on a publically accessible website so that Blog Scientists can look for problems to report to Fox News. In addition scientists must keep an up to date hourly photo record of all stationary instruments. Photos should be taken from above, below, left, right, front and back at 5 different zoom levels. These photos should also be uploaded to the website. Failure to undertake any of the necessary compliance criteria will result in the underlying science being discredited and any theories in the field of science will become void. I was shocked to find that Climate Science fails all points of my principles. On all points they have either not applied my principles or have neglected to provide sufficient documentation. Therefore Not the IPCC. A random paper I surveyed, Mann et al 1999, did not contain a Stationary Record Sheet! For this reason Mann does not received a Principles of Stationary compliance certificate from myself. Neither has anyone in IPCC headquarters contacted me about this. This is sheer negligence. Dangerous negligence. Once Cuccinelli has finished having his go, I recommend that we next go after Micheal Mann's stationary. 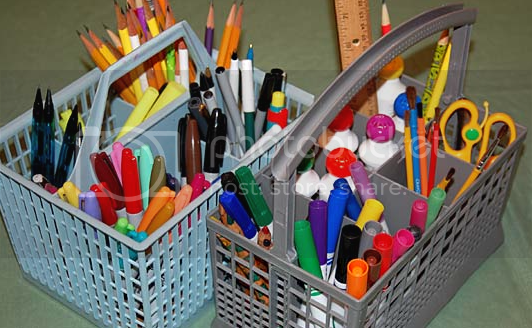 All pens and pencils that he's ever touched should be placed carefully into clear bags for CSI style analysis. We mustn't falter from inventing new ways of keeping alive the idea that Micheal Mann is hiding something. I stopped blogging as I decided manmade global warming was finally dead. Then this morning over breakfast an article in the local paper caught my eye and caused me great concern. "Mild weather to continue into next week"
Could it be? The title was indeed very alarmist. Had man-made global warming escaped it's coffin of infinite nails to once again threaten the free world? I fled to the box room and dusted off the computer, flipping the switch for the first time in two months. When I peered into the internet my worst fears were confirmed. Realclimate still existed. Running Rabett and Wikipedia Stoat were still at large. So was I wrong to think manmade global warming was dead? No, so far I have never been wrong and it would be odd if that had changed. Anyway I was there. I saw the smoking guns. I read the emails. Even Harry who wrote all the IPCC climate models admitted they are all bogus. It is clear that AGW has risen from the dead. That's how I explain it. I just have to keep going with more nails. But how do you kill something that is already dead? A Daily Mail Blog reports that Virginia’s Republican attorney general, Ken Cuccinelli, has made his move toward a Climategate lawsuit by demanding that the University of Virginia turn over documents related to Michael Mann. I left a comment on the blog which has now passed moderation. This is good news, but doesn’t go far enough. We need to demand that *all* so-called “universities” the world over hand over *all* data and emails that has ever passed by so-called “scientists”. I am sure that in decades of research and data there will be something we can use to convince the public that science is corrupted by liberal bias and needs to be reformed. The first step will be to abolish so-called “peer review” and “peer reviewed journals”, which are corrupt and elitist. Even scientists admit peer review is flawed. All science should be done on blogs. And anyone should be able to contribute, no matter their level of expertize or PHds (”expert” is a term of elitist discrimination). Let the public decide what science they like and what science is wrong. Blog Science is freedom of science. There is only one caveat to freedom of science however. To prevent the likes of the manmade global warming myth from ever occuring again we must make sure that anyone who proposes a theory that can potentially harm the economy or usher in UN world government should be immediately fired and charged with criminal offenses. A cross party political body in every university should be in charge of detecting and blocking funding of any such potentially subversive research. The age of the “intellectual elite” is over. Now is the age of Blog Science. It’s time we went back to science of the 20s and 30s where every Bob in the street had a good idea of what was right and proper and scientific. Afterall anyone can spot if an aircraft can fly or not. It's the Daily Mail so I think they know what they are talking about.